A) Buy commercially produced seed in packets of named varieties. 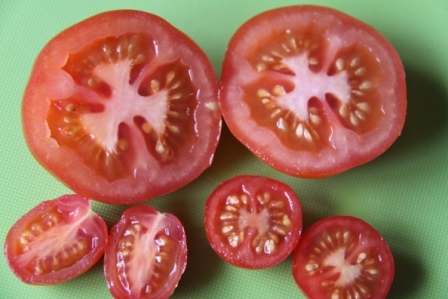 B) Collect seeds from your favourite tasty tomatoes. Please note that plants grown from any seeds you gather may not be identical to the parent plant… but that adds to the fun. Here’s a step by step guide to sowing tomato seeds. Go straight to step 5 if you have already bought seeds. 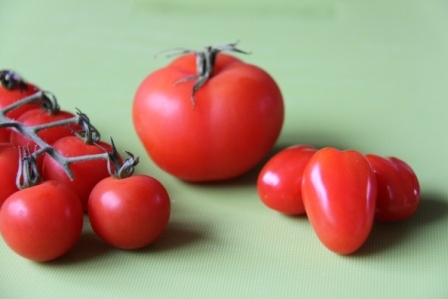 1) First select the tomatoes you want to grow – tiny juicy cherry tomatoes, huge meaty beefsteak tomatoes or tangy salad tomatoes. There are hundreds to choose from so just pick the flavours you like the best. 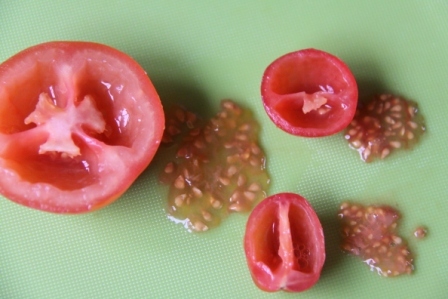 2) Cut the tomatoes in half and scoop out the seeds with a teaspoon. 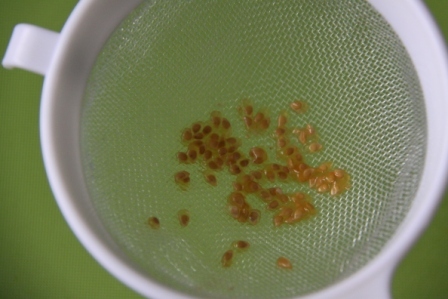 3) Rinse the seeds under cold water in a fine sieve to remove any juice and flesh. 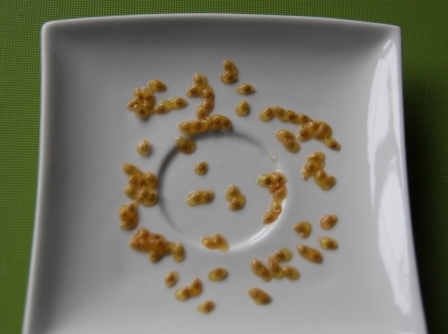 4) Transfer the seeds to a clean saucer. 5) Fill a small pot with compost, level and gently firm the surface. Sow the seeds thinly using a clean plant label to help you space them out. 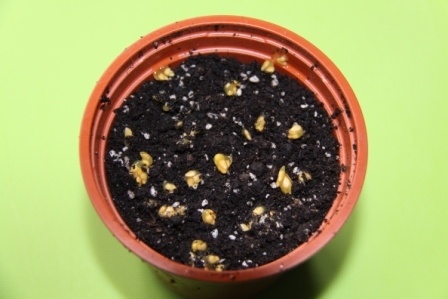 Cover the seeds with compost – go easy here, just a light covering is required. 6) Label the pot and stand in a dish of water for about ten minutes to allow the compost to absorb enough water – you’ll see the surface become wet. Drain off excess water. 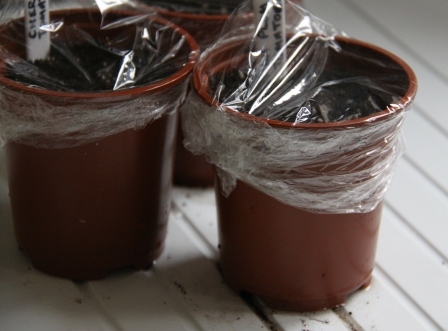 7) Wrap each pot with cling film and place in a warm spot for germination. 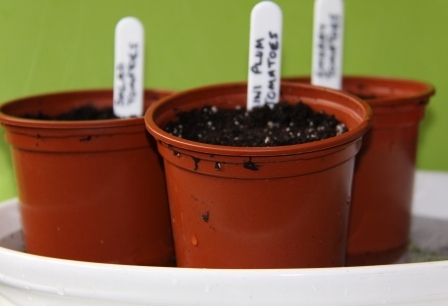 A propagator is ideal but you can use your airing cupboard or any other consistently warm room. I always use our boiler room which is warm and dark. 21°C (70°F) is the ideal temperature. Seedlings will appear in about 5 days. Check every day then when you see the first few shoots move the pot to a windowsill or greenhouse. Your tomato seedlings need plenty of light and a temperature of about 18°C (65°) Allow them to grow on for about two weeks. 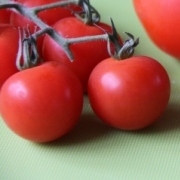 Buy or collect some tomato seeds and have a go at growing your own tomatoes. Your children will love this… Hope you all have fun with your seed sowing. In Part Two I will explain how to transplant your seedlings and grow them on so you have lovely productive fruiting plants.